The TD First Class Visa Signature Credit Card currently has an Informr score of 4.8 out of 10. This score is based on our evaluation of 2 sources including reviews from users and the web's most trusted critics. 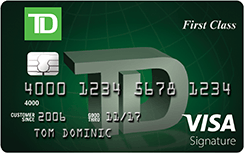 TD First Class Visa Signature Credit Card is typically available to those with excellent credit scores (650 or greater). Don’t be fooled by this card’s triple rewards rate or pricey annual fee; despite being billed as a premium rewards card, the TD First Class Visa Signature card delivers surprisingly little value for a card with an annual fee. On purchases within the first 6 months. The TD First Class Visa Signature Credit Card is a solid choice for travelers looking to gain rewards miles for their consistent traveling and dining out. 3x points on eligible travel-related and dining purchases, paired with 1x points on all other buys makes for a straightforward rewards system card that makes earning miles easy for cardholders.